The second beta of iOS 7 is now available to download for registered developers. Arriving as build 11A4400F, this update includes many bug fixes and improvements to the beta release, and is available for iPhone 4, iPhone 4S, iPhone 5, iPod touch 5th gen, iPad 2, iPad 3, iPad 4, and iPad Mini. 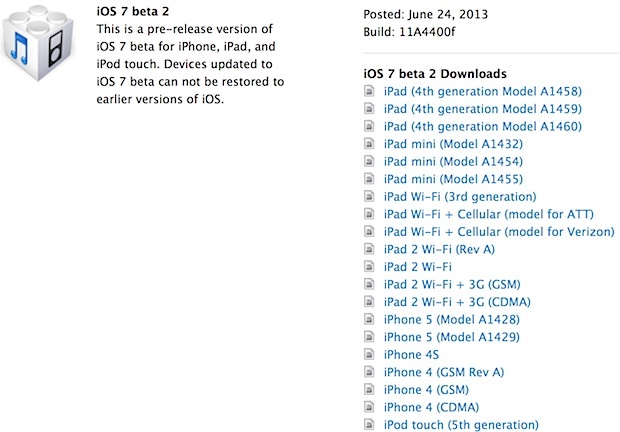 This is the first iOS 7 beta that has been made available for the iPad series. 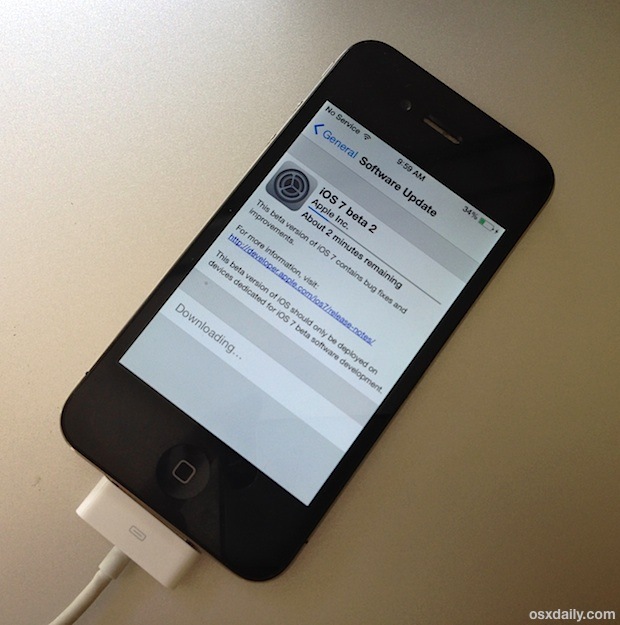 The easiest way to download iOS 7 beta 2 is through Over-the-Air update on any device currently running the first beta. Apple’s developer site also includes download links as usual. This can be done through Settings > General > Software Update. The OTA download weighs in between 160MB and 240MB, depending on the device that iOS 7 is installed on. Downloading the update is quite fast, but many who are installing the update currently find that it sits on “Preparing Update…” for quite a while, with a very slow moving progress bar. Once that is finished, tap on “Install Update” to proceed with the actual installation, where a “Verifying Update” message appears before the device reboots with a new progress bar, before launching into the second beta. iOS developers registered with Apple can also log into Apple’s Developer Center to get direct download links to beta 2 IPSW. Those wishing to install iOS 7 beta 2 on an iPad must use the developer portal and download the firmware directly from Apple. iOS 7 is a significant overhaul of iOS, with vastly different user interface elements and tons of new features. iPhone, iPad, and iPod touch owners who are not part of the developer program can preview the new iOS on their devices using videos and screen shots from Apple, otherwise they must wait until this Fall for the wider public release.